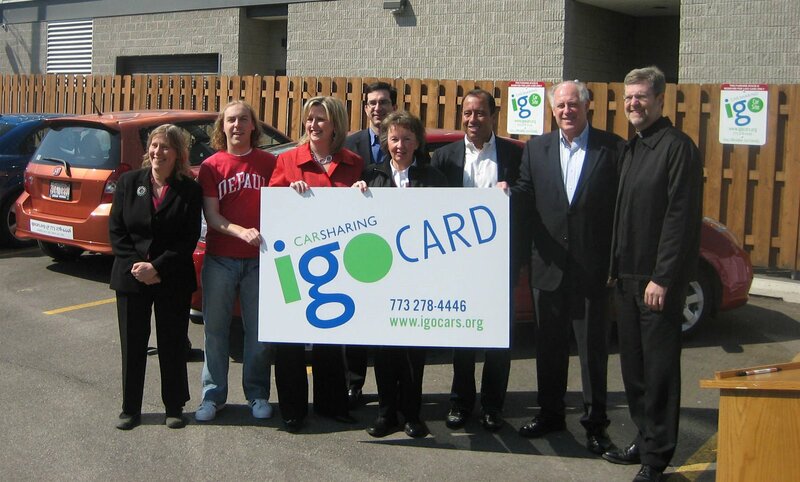 Above: Quinn, second from right, with I-GO CEO Sharon Feigon (far left) and DePaul University representatives during an I-GO/DePaul partnership ceremony in spring 2008. As Rod Blagojevich’s governorship implodes, and Illinois Lt. Gov. Pat Quinn prepares to take the reins of the unwieldy contraption known as the State of Illinois government, we at I-GO Car Sharing would like to acknowledge that Pat’s an old supporter of our organization and an avid supporter of car sharing and green, sustainable public transit. Chicagoist just reposted an archived interview they conducted with Quinn in April 2007. When asked for his opinion on transit, Quinn gives I-GO a huge plug as part of the solution for a more efficient public transit system. He’s quite the fortune teller: Just a few weeks ago, the CTA and I-GO joined forces to create a new Chicago Card Plus/I-GO smart card that can be used to ride CTA trains and buses and also access I-GO’s fleet of cars across Chicago, Evanston and Oak Park. Chicagoist: When you talk about tax relief and budgets in the State of Illinois, those three things – education, health care and tax relief always seem to come up. On a more local level, what would you propose to solve the transit crisis in the region? Pat Quinn: Well, I take the CTA, and have all my adult life. And I think it really is a crisis. I think the poor service, the trains not always clean as they should be, management leaving a lot to be desired, this should really be addressed. We need the so-called [Regional Transit Authority] to really truly be regional. Too many turf wars between Pace, Metra, CTA, RTA. Given the crisis we have, and the sustainability challenge we have, to have a green way of thinking, where you need to have an excellent public transit system, I think you just can’t hand out money in Springfield to agencies that have been acting in a dysfunctional manner. So I think you have to put some strings on that to get better performance. An example would be a universal pass, which you could use for all transit services, including there’s something we know about called I-GO, which is car-sharing. So you have your transit pass, if you wanted to use a car, and use it for an hour, you know you have this not-for-profit entity, and you can get an I-GO car, and use your pass to drive for an hour to shop, and then bring it back to where the space is. To me those are the creative solutions we need to have right now. You are currently browsing the archives for the CCP/I-GO Card category.